Now you can enjoy warm banana “bread” within minutes! 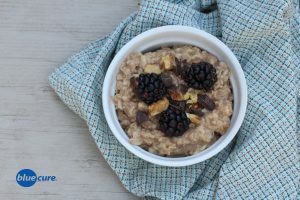 This banana bread oatmeal is a quick, whole grain breakfast that’s naturally sweet and flavorful. Oats are a nutrient dense food, packed with protein (5 grams for ½ cup dry), fiber (4 grams for ½ cup dry), and antioxidants. Oats are rich in polyphenols, a kind of antioxidant that is known to have anti-inflammatory effects. Combine 2.5 cups water and oats in a small pot. Bring the water to a boil, and then reduce the heat to medium-low. Add the banana slices, cinnamon, and vanilla to the pot. Stir until well combined and allow to heat slightly. Add the ground flax near the end of cooking and remove from the heat. Divide the oatmeal into 2-3 bowls and top with additional banana slices, berries, dark chocolate pieces, walnuts, or peanut butter. Enjoy!